Did you know there was an article featuring the French stitching style in the issue of World of Cross Stitching currently on sale? We are very honoured that Cathy Lewis has chosen "Les Macarons", a design by Malin Maline, as one of the pictures that illustrates this column. You can browse all Malin Maline designs here, our complete collection of "Cakes and sweets" here or else all the "Kitchen and food" designs there. 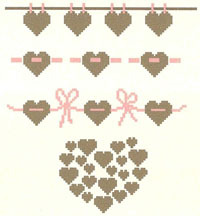 And have a look at our "Tea time and coffee time selection" too, just in case your "just-perfect-for-me" pattern is there! Thanks to the 47 new designs that have been added since the beginning of April, we are very pleased to display from now on more than 460 French designs. The 5 colourful and lively characters of the pirates' series by Au Chat qui Dort (see left) are amongst them. Obviously so are the 15 designs by our new designer "Alice & Co" and the fairy tale series by Madame la Fée (see the dedicated articles below). But there are many more! (Re-)discover them in pictures in this article, just to make sure you didn't miss one! 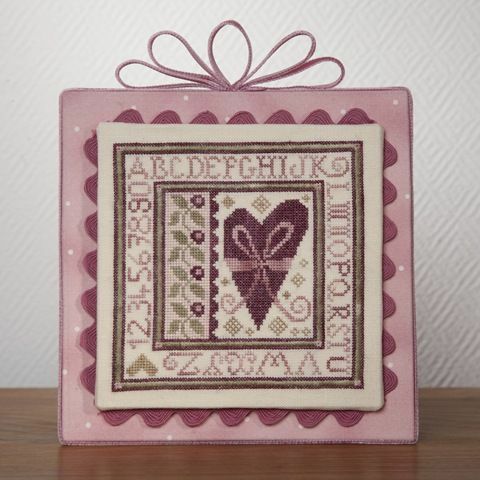 Read more: 463 French cross stitch designs on board! As announced in our April newsletter, we are very pleased to welcome in our collections the designer Alice & Co. Meanwhile there are already lovely and funny designs to discover in our selection. Just have a look at it and tell us what you think! 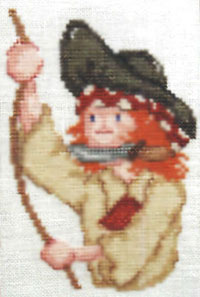 The latest design by Madame La Fée, Pinocchio, is on line! Fairy tales and children books have always been very inspiring for our designers. Discover in this article some of the cross-stitch designs that really take us far far away while stitching. Read more: Pinocchio, Alice, Denis, Leon and many more are waiting for you! Well, completing on time this lovely design of Le Lin d'Isabelle "A little rabbit has come in my garden" may be a bit challenging. 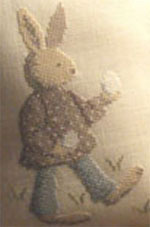 But using an original linen band, pre-printed with Easter eggs, to stitch a small message or pattern is still possible! We hope you will have a good time having a look at our new Easter selection and its sweet little bunnies. In all cases, no regrets, Easter will be back next year! It is not (only) because of our first birthday, we do have a sweet tooth! That is why at our boutique, cakes and sweets are not anymore "just patterns to stitch". From now on, they are also embellishments! Maybe a good opportunity to (re-)discover the cute and useful items that hide in this range of products. For instance, you can find some gorgeous cupcakes in our Ribbons and Braids section. And try to make a choice among our delicious pies and chocolate selection that are displayed in our Pendants and Charms section. Unless you prefer jam or Religieuses cakes? Then perhaps you should have a look at the Pre-printed Linen and Bands. And macaroons? Well, I'm afraid they are everywhere! To celebrate our first birthday, we are offering 10 readers of Cross-Stitcher magazine the chance to receive a £15 voucher to spend at our online boutique! To enter the competition, visit Cross-Stitcher magazine's website and go to their Competitions' section (left menu) and then on "SoCreaStitch giveaway". The competition closes on the 18th of April 2011. Who will be the ten luckiest ones? Jolies Pâtisseries, this lovely cake stand by Malin Maline is available here. It is part of a series which comprises Cupcakes, Macaroons, Religieuses Cakes and Doughnuts. And we've got many other attractive designs that will make your mouth water in our Cakes and Sweets designs section. So don't try to resist, just indulge yourself! Spring is back! So says my calendar and more important, so says the sun in the blue sky! 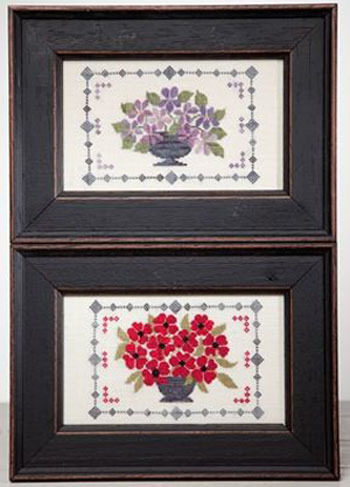 The charming "Carré Bouquet", a new Tralala design, could be a nice way to welcome the Spring back in stitching. The renewal in Nature has always greatly inspired French cross-stitch designers and many designs could help you to celebrate the Spring in various projects for your home or children/great-children. Unfortunately we cannot come to the Stitch & Craft Show at Olympia this year. But we do not forget it was there that we launched our business one year ago and met so many of you. We've decided to celebrate this special event by offering you free delivery for all UK orders placed on the online boutique during the show. This means that from Thursday 17th to Sunday 20th, the delivery costs = £0 provided that you live in the UK. So for those of you who go to the Olympia Show, have fun but don't forget to save some money to spend on our online boutique! And for those who don't go, just enjoy a free delivery cost whatever you choose to order! What a great gift this will make! 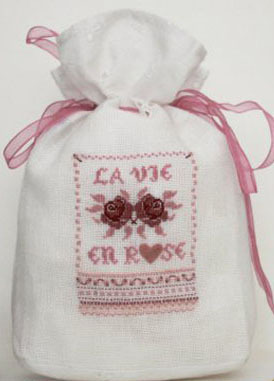 You can of course choose to stitch on it the beautiful roses of La Vie en Rose, a design by Les Créations de Chrystelle created especially for this pouch. Released mid-February in Paris during l'Aiguille en Fête (the biggest needle craft show in France) the two latest patterns by Tralala are available online. 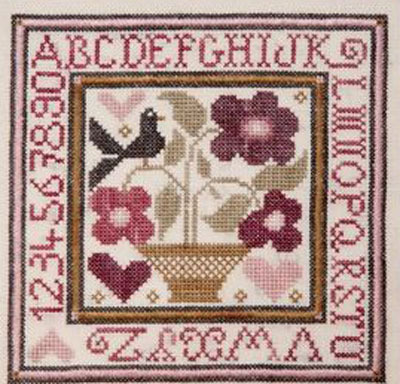 Discover the gorgeous poppies and violets featured in the third design of the Floralie series so eagerly awaited by many stitchers. And what about the Carre Coeur design? We are just fond of its lovely camaieu of pinks and greens! 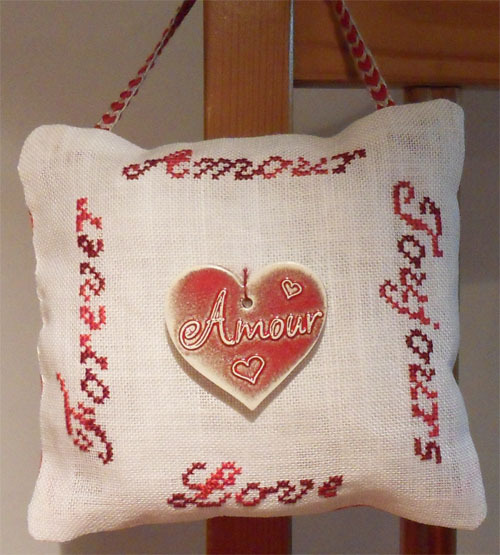 We are very pleased to offer you "Amour Toujours", a small free cross-stitch chart inspired by the ceramic heart "Amour" (Rouge Petit Coeur). You can obviously use this chart for any Valentine's Day project or keep it for a permanent decoration as we have chosen to do. We couldn't find the time to put earlier this article on line, but here it is! Read the complete article from the Cross-Stitcher magazine (issue n°231) featuring Bois Joli designer.